One of the features of this show is that it has two protagonists in Slaine and Inaho. What roles have you had each of them carry? The axis of Aldnoah.Zero is the conflict between Earth and Mars, and we wanted to place them within the forces moving this conflict. On the one hand, we have Slaine as the protagonist on the Mars side. In the early stages of planning, he was actually a character hiding a strong, rebellious spirit. Despite the abuse and oppression he received at the hands of the Vers knights, within his heart burned a strong desire to return the favour one day. However, as we kept developing the story, he changed into “a boy who’s spirit has been broken through that oppression.” Even if he fights back, he has no allies, and his only reward is even greater pain, so he has no choice but to obediently follow the orders he’s given. His one solace is Asseylum, who brings kindness and warmth to his life. It’s because of this background that Slaine became a character so focused on Asseylum, to the point that he would give his life to protect her, like a faithful dog. Turning now to the protagonist on the Earth side, Inaho: how would you describe him? Inaho is the character created so that we could demonstrate how the attacks from Vers affect the people of Earth, from the point of view of a normal high school student. In order to show how our protagonist could defeat the far more powerful Martian Kataphrakts with the weaker Earth ones, because of his keen observation skills, calm demeanour and good judgement, we gave him a calm and reticent personally right from the get-go. However, the further we got in the planning stages, the more calm and collected he became. But even though his expressions don’t change much because of this personality, it’s not that he’s emotionless. He actually thinks about his friends more than most others would, and he also has good leadership qualities. Could you tell us why Inaho is always so calm and collected? Which scenes do you think best show how much these two protagonists (Slaine, Inaho) have changed? I would have to say episode 12, without a doubt. For the Slaine we met at the start of the story, his reaction in this scene could believeably have been to run to Asseylum and fight with Inaho to protect her. That he didn’t shows that, due to his understanding of Saazbaum’s great cause, his view of the world in which Princess Asseylum was held above everything else has been shaken greatly. Another thing about that scene is that Inaho’s actions after Asseylum is shot are completely different from what we (the production committee) originally envisioned. That scene has changed a lot from what we planned at first. Originally, even though Slaine turned his gun on Saazbaum, he was meant to be unable to shoot because he had started to sympathise with that great cause. On the other hand, Inaho didn’t turn towards Asseylum, but instead tried to finish off Saazbaum by shooting him, even though he himself was heavily wounded. However, because he was reeling (from his injuries), he would miss several times, and Slaine would shoot him in the end. So the end result of Slaine shooting Inaho remained the same, but the way it happened was completely different. At the start, we thought that Inaho wouldn’t really change that much even though he was acting alongside Asseylum. But as the story progressed, Asseylum’s existence had much more of an impact on him then expected. Until that point, Inaho had always strived to complete the objective, based on that cool, logical side of his. The fact that he has done something so unthinkable, given his personality, shows just how much he’s changed. Since Aoki’s interview in Guidebook 1 says something similar about both Slaine and Inaho, I’ll just leave it aside for the moment. In fact, a lot of what I’ve read so far was also covered in the radio show episode that I’ve already translated! The major point that comes through time and time again, however, is that Aoki is the one responsible for the characters. Generally speaking, what he’s most interested in is how characters and their relationships change in the course of a story. The thing is, the ending that Aoki describes in his Newtype interview above seems to have Inaho and Asseylum both falling as well. So, if Aoki was answering Amamiya literally, then does that mean the the original story outline was different yet again? Or was he not answering the question that literally, taking it to mean “was the ending exactly as you first envisioned it?” instead? I wonder if he’s discussed it in any other interviews! now I know much more about the personality of Inaho. But today (or tomorrow) we will know if he is alive. the preview of episode 13 looks like it has a small team skip. Anyways, thanks for commenting! 11 hours and counting! 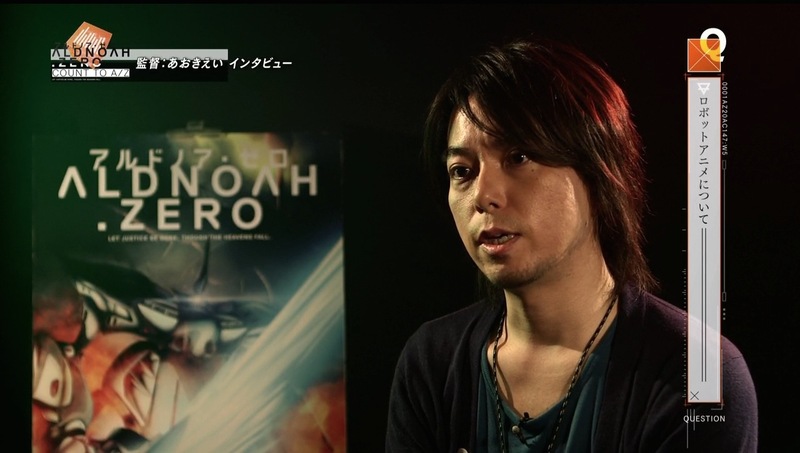 Thank you for writing about Aldnoah.Zero. I wonder if it surpasses Macross in posts?! Now that Fate S1 is over, bring on Aldnoah.Zero S2. No problem – I’ve been having a lot of fun with it, I must admit! Surpassing Macross? No, not even half way there yet! And there’s a new series coming too, so I seriously doubt it will!